***Fullest disclosure: I'm being very generous when I call anything on this blog humorous. The man in the comic does look curiously similar to the artist. Here's another excuse to use as you usher them off your doorstep: "No thanks--I already friended you on Facebook." 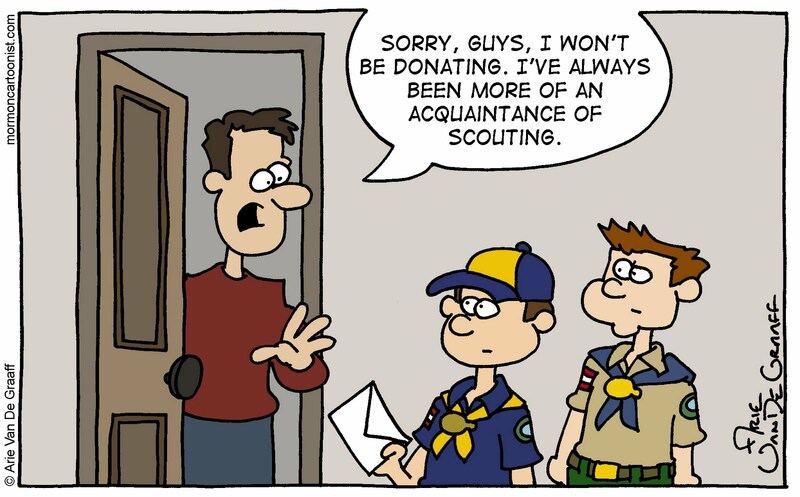 This comic sounds like it was created by someone who didn't get their Eagle Scout. I'm so disappointed. Jena, you have to bring that up again, don't you? Yeah, I didn't get my eagle scout award. The committee board frowned on my proposed eagle project of fastening little toupees on the bald ones. 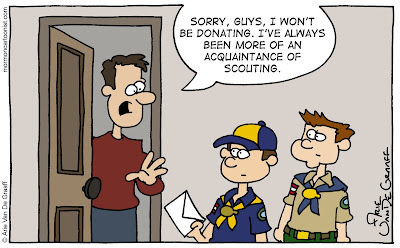 But now they have to deal with a lifetime of Boy Scout jokes! Who's laughing now? You should be commended for not getting your eagle. That project is forced on young men against their will. It's un-american and you, my friend, are a trailblazer and a hero. The only trailblazing I did, Joel, was for a little brother who didn't have quite as much pressure to earn an Eagle after his brother failed to do so.